Rich, sweet organic passata with just one ingredient – tomatoes ripened in the Italian sun. This store cupboard stable enhances the richness of pasta sauces, soups, and any other dish calling for a tomatoey bass note. Add a few ice cubes for a refreshing summer drink (and vodka, Worcester sauce, Tabasco and lemon for something more bracing). Unopened passata will keep indefinitely in a cool, dry place. Once opened, keep it in the fridge and use within a week. 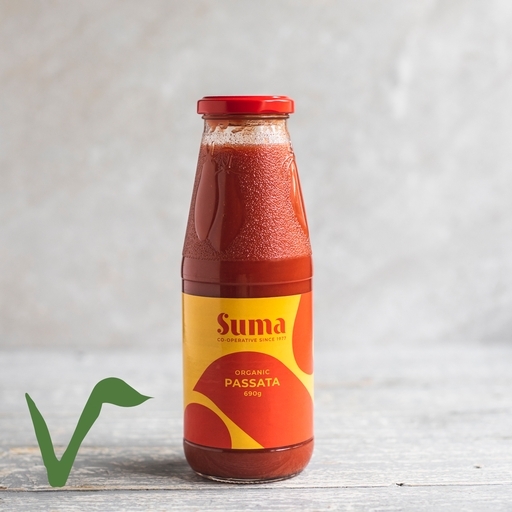 Suma, based in West Yorkshire, is Europe’s largest equal-wage workers’ cooperative, and the UK’s largest independent supplier of wholefoods. They’ve been trading in ethical produce for even longer than Riverford, and since 1977 their own brand has pioneered many industry firsts: first organic chopped tomatoes, first recycled toilet roll and first organic tinned beans, to name just a few. They might have grown a lot since their early days in a rented lock-up garage in Leeds, but Suma have never lost sight of their core values: everything they sell is ethically sourced, fairly traded, and fantastic quality.